Box Text: New heroes to discover, new worlds to conquer. Expand your empire and rule the world. Experience the adventure of the Spanish Conquistadors as they enter the exotic lands of the Aztecs, or relive the destructive force of Attila's hoards of pillaging Huns. 07-21-2013 Seikenfreak Box Text New heroes to discover, new worlds to conquer. Expand your empire and rule the world. Experience the adventure of the Spanish Conquistadors as they enter the exotic lands of the Aztecs, or relive the destructive force of Attila's hoards of pillaging Huns. 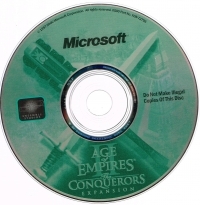 This is a list of VGCollect users who have Age of Empires II: The Conquerors Expansion in their Collection. 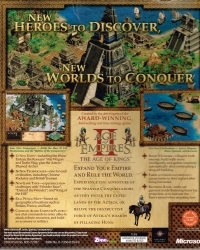 This is a list of VGCollect users who have Age of Empires II: The Conquerors Expansion in their Sell List. 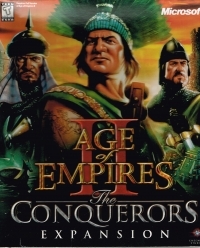 This is a list of VGCollect users who have Age of Empires II: The Conquerors Expansion in their Wish List.